The Wesleyan Chapel in Mill Road, West Mersea. It is now known as the Methodist Church. Wesleyan Methodism began here, as far as can be traced, in 1832. At that time a Welsh Coastguard by the name of Hughes was stationed here. Being a Wesleyan man, he was most disappointed at not finding a Wesleyan Chapel on the Island, so he started meetings in his own house in Coast Road. Unfortunately we are not sure exactly just where he lived, and no records have been found of any meetings which took place at that time. However the numbers attending soon became too many to be accommodated in his house, and the meetings were transferred to a Barn in Barfield Road. This was used until 1861 when the present Chapel was built and opened. Many of us still remember the old Barn, which eventually finished up as a Garage and Workshop for Day's buses, though it had remained standing near the County Primary School well into the 1930s. When Miss Sybil Brand compiled her short history of Mersea Methodism for the Centenary Celebrations in 1961, she was unable to find a record of the actual opening date of the present building and a record was found that a certain Mr John Ward (farmer of Rewsals Hall Farm, East Mersea) and one of the first trustees, sent a letter applying for permission to use Culver Street Chapel in Colchester on a week day on the occasion of the New Chapel at West Mersea, This letter was dated 4 April, 1861, which implied that the building was near completion. It appears that they did not intend the official opening to take place on the Island, but no date was given as to when the opening would be. Rumour has it that it was built with bricks brought from a hall being demolished in Fingringhoe at that time. However, after careful searching of existing records and with the willing help of the staff at Essex Records Office in Colchester, this was not confirmed. I was able to establish from records obtained there, the actual date of the opening from the foregoing account which I quote. Note the cost! 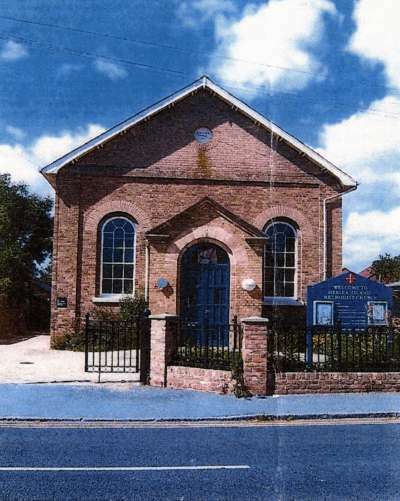 "On Wednesday July 10 1861 a new Wesleyan Chapel was opened at West Mersea. It is intended to accommodate 250 people at a cost of £300, and is built of white brick and slated. The sermon in the morning was preached by the Rev. G. Blanchflower, a former Minister at Colchester, and now stationed at Cambourne in Cornwall. He took his text from Matthew 12 vs 48-50. The Chapel was full to overflowing. Afterwards about 150 persons dined in a large Booth erected in a Meadow near the house of Mr John Ward of Rewsals Hall Farm, East Mersea, who kindly opened his House, Gardens and Grounds for the accommodations of visitors, who during the afternoon enjoyed a ramble along the beach until 5 o'clock when 290 persons sat down to tea. In consequence of the large concourse of people, it was decided to hold the Evening Service in the Booth, the Chapel not being capacious enough to hold the large congregation. The sermon in the evening was preached from Luke 10 vs 38-39; The collection amounted to £20. The total proceeds for the day reaching nearly £40!" West Mersea Methodist Church 125th Anniversary. Flower Festival.